Just hours ago, Twitter began rolling out some new features to help users stay in the loop. The new additions are available under a new tab on the home page named Activity. The stream surfaces what people you follow are doing around Twitter. This includes tweets they recently favorited and retweeted or users they followed. 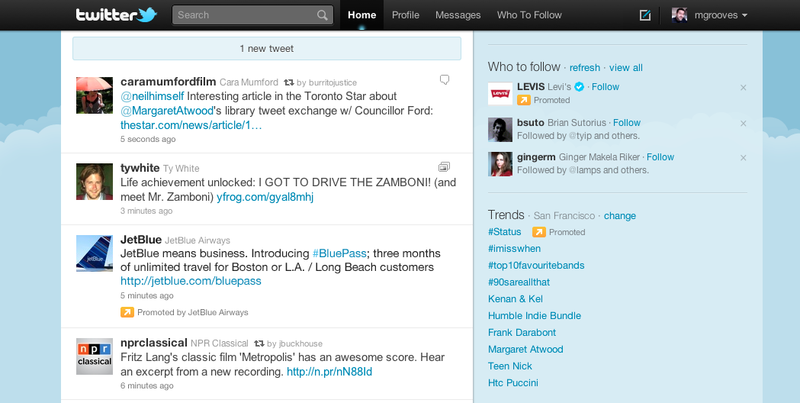 Twitter organizes it in a fashion remarkably similar to the Facebook news feed. Each type of activity displays differently in the stream. If a user follows someone new, the user they followed shows up in a small box with a thumbnail photo, username and name, and a Follow button. Just thumbnails appear if they follow several users. Favorites and retweets show up as blockquotes. These expand into the sidebar like regular tweets if you click them. Another great feature about the Activity feed is it updates in real-time. Facebook’s news feed supposedly does too, but I find it slow and inconsistent. If the Activity feature rolls out for your account, you will notice the Retweets tab has vanished. Indeed, the Activity tab does replace Retweets, but you can still view them within the stream. But what if you are trying to find your own tweets that others have retweeted? These are actually now placed under the @you tab. Originally just housing replies, this is now the home for any activity involving yourself. These shows up here if you or any of your tweets receive mentions, follows, favorites, or retweets. So far I am enjoying the new features on Twitter, and I hope they will eventually make their way onto mobile devices and apps. I would not call the Activity tab a copy of the Facebook news feed, but rather a fresh interpretation. In fact, the way Twitter separates types and subjects of content into different tabs makes Facebook seem awfully cluttered. Again, since this is a roll out, some Twitter users may not receive the new Activity stream for a few weeks.